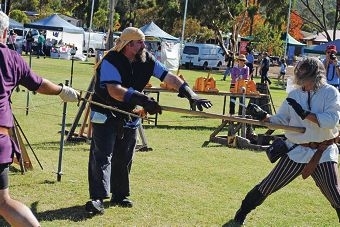 Some of the action at last year’s Iron Festival. The Wundowie Iron Festival will celebrate the heritage of the town with iron sculptures, paintings and photography. The festival is held at the Wundowie Community Hall and oval from 9am to 4pm. Event organiser Trish Hamilton said she founded the festival in a bid to ‘put Wundowie on the map’. The festival is heritage listed and has been running since 2007. More than 2000 |people are expected to attend this year. ‘The thing everybody loves is the bus tour of the foundry and the circle of swords, where a medieval group sword fight,’ Ms Hamilton said. ‘The football club will be doing a ‘toss the iron pig’ competition and there will be an iron beast competition.’ The iron beast is an individual or team effort to build a device ” predominantly from iron and steel ” propelled by the down force of a 20kg weight. A prize of $1000 will be awarded for the longest distance travelled in 30 seconds. The town’s industrial history began on April 15, 1948, when the Wundowie Charcoal Iron and Steel mill was opened. The mill closed in 1981 and engineering company Bradken now operate out of the foundry, maintaining a link to Wundowie’s commercial heritage. The Iron Festival will include prize money of $1500 for the best iron sculpture, $1000 for an iron-themed painting, $500 for a utility object made from iron, $500 for photography with an iron theme and $250. All work will be displayed in the hall from 10am to 4pm.